Four centuries ago, a magnificent king built his city of dreams on a hill. And then after a few years he walked away from it, never to return. 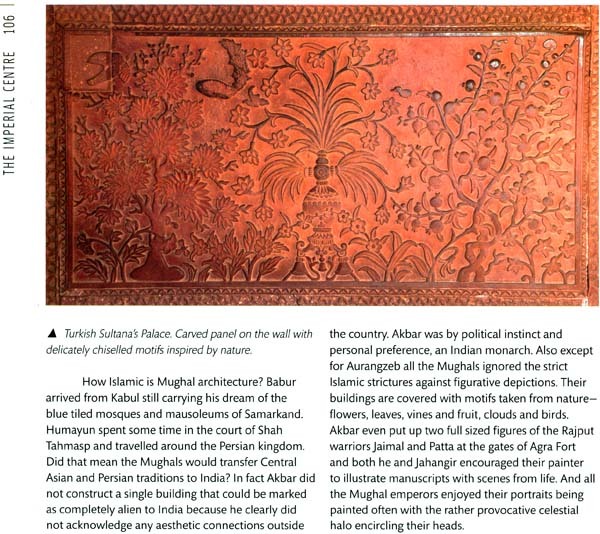 The reason why Jalaluddin Akbar abandoned the city of Fatehpur Sikri remains a mystery. It is a city of legends frozen in time of a grateful king's act of gratitude to a Sufi saint, and of a warrior who raised a giant gateway as an arrogant symbol of his power. The city saw the most gorgeous gatherings in Akbar's cournt – the poets Faizi and Abdul Rahim, the historian Abul Fazl, the singers Tansen and Baz Bahadur and courtiers like Man Singh, Birbal and Todar Mal. Few cities reflect the character of its builder like Fatehpur Sikri does; that of a hard-headed imperialist who was also genuinely humane and tolerant and embarked on an unusual spiritual quest. 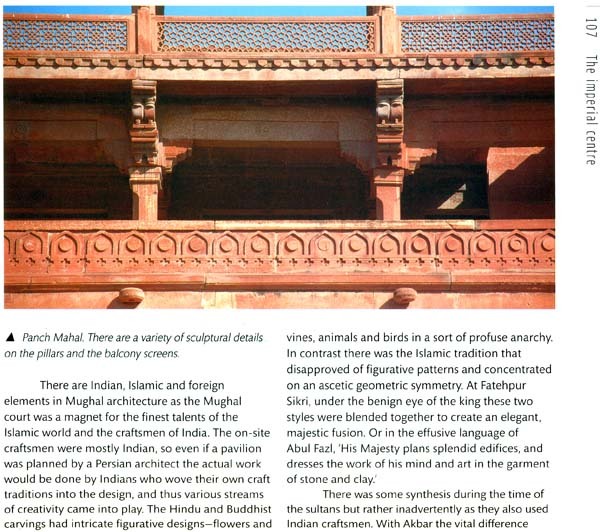 To understand Jalaluddin Akbar you have to seek him in red sandstone shadows of Fatehpur Sikri. Subhadra Sen Gupta likes to explore the various aspects of Indian history and culture through her fiction and travel writing. 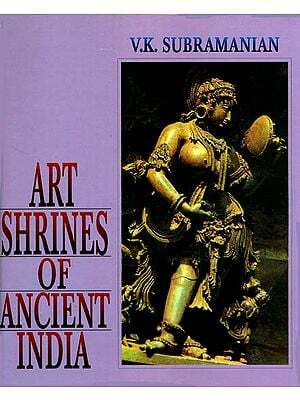 Her books try to capture the fascinating, vibrant and many – hued aspects of the people, places and history of India. She also enjoys writing historical fiction for children and scripting comic Books. Prakash Israni, a product of Sri J.J. Institute of Applied Art , is a well – known name in the photography world – covering Bollywood to advertising, travel photography to travel writing. His first picture was published way back in 1972 in a local catholic newsletter in Mumbai, and since then there has been no looking back. Fatehpur sikri wears many faces. It captures that elusive blend of a king's love for royal pageantry and his Philosophical quest for the meaning of life. It was a royal capital, a centre of art and culture and at its spiritual heart there is a Sufi dargah that has drawn Muslim and Hindu pilgrims for centuries. It was built as an act of thanksgiving for the blessings of a saint that gave a king a long awaited heir. This was the city of Jalaluddin Akbar who was a warrior, conqueror, empire builder and a superbly inventive king. He was also a man who questioned the certainties of formal religion and searched for answers along the thinkers of his kingdom. He relished not just the aspirations of the world but also the subtle in india carries the stamp of its creator like Fatehpur Sikri. Akbar's city of dreams deserves one's undivided attention and a spirit of curiosity and adventure. The Archaeological Survey of India lists over seventy monuments here, so there is much to see and savour, not just opulent palaces and arrogantly rising gateways but a lotus pool where a great singer sang to his king and the serene mausoleum of a Sufi Preacher who lived a simple, ascetic life of prayer but now lies surrounded by luxurious marble. At Fatehpur Sikri, among the silent courtyards, shadowy palaces and by the carved pillars, Akbar's spirit still pervades the air. He is the ever present spectre in his ghostly city, a benign, regal presence you can sense everywhere. He was familiar with building here, he wandered about as it was being built and even worked beside the architects and craftsmen. Then he sat dispensing justice from the Diwan-i-Aam, greeted foreign envoys in the Diwan-i-Khas and climbed to the top of panch Mahal to enjoy the monsoon breeze. Fatehpur Sikri is the first planned city in medieval india and its designer was a king. As historian Milo C. Beach says, it was built during the most innovative years of his reign. In the sixteenth century this was the premier Mughal city, admired for its rich citizens, noble mansions and colourful bazaars but that was a long time ago. Agra was forgotten when Akbar's grandson Shah Jahan shifted his capital to Delhi in the seventeenth century. During the British Raj it was a cantonment town, what was called a moffusil and today it lives for the tourists coming to see the Taj Mahal. Somehow the presence of the Taj distracts visitors from the magic of Fatehpur Sikri when in many ways it is a much more intricate experience. Agra and Fatehpur Silkri lie in the plains of the River Yamuna and the great Ganges flows to the east. The landscape is flat with an occasional hill near the horizon and it is the most Fertile part of North India. Everywhere there are neat fields and large shady trees, orchards of mangoes and giant banyans letting down their roots to the ground and the spread of trees, orchards of mangoes and giant banyans letting down their roots to the ground and the spread of margosa with their narrow, bitter leaves and dappled shade. Everywhere you will se the myriad gifts of that Mughal presence except an occasional kos minar, the pyramidal stone milestones or a patch of a wall that may have once been a serai, an inn. Here carved sandstone pillars prop up tiled roofs of a village home, a mosque has a slender marble minaret and children play by a nameless still carries the memory of those vivid Mughal times. This ancient land has seen human habitation from pre-historic times. Here archaeologists have found Neolithic rock paintings and Rajputs have chltivated this land from the time of the epic battle described in the Mahabharata. The land has grown wise and cynical seeing the ups and down of history, watching with all knowing eyes the puny ambitions of men, the invading armies and the builders of cities. They all come and go but what remains is the flowing river, the Brahminy kites wheeling high up in the sky and the ever changing seasons. Only a few leave their stamp on the landscape, one was a king and another was a reclusive Sufi saint. And they left behind a city that became frozen in time.